We welcome another guest post from Megan's sister, Nancy! I was really excited to see this months ingredient, these Beauties have fantastic ideas! Artichokes have been a long time family favorite. In fact, when we lived in Maine when I was in high school, you couldn't buy artichokes, and when our aunt came to visit from California she would bring them in her suitcase. My attempt at stuffed artichokes was inspired by an amazing meal I had in Rome many years ago. I have had Italy on my mind as I am heading there this October to celebrate my...let's just say a recent milestone birthday. 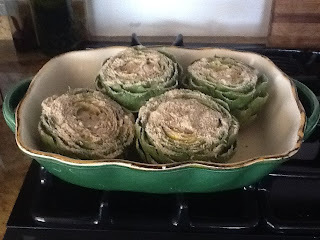 I decided since I still have a few months to go, I would attempt to make these artichokes at home. I did a bit of research on a variety of stuffed artichoke options, but since the artichoke of my remembered dreams had bread crumbs, I opted for a this recipe. There is a bit of effort associated with the actually 'stuffing' but it wasn't as bad as I thought! This recipe is from Saveur.com. 1. 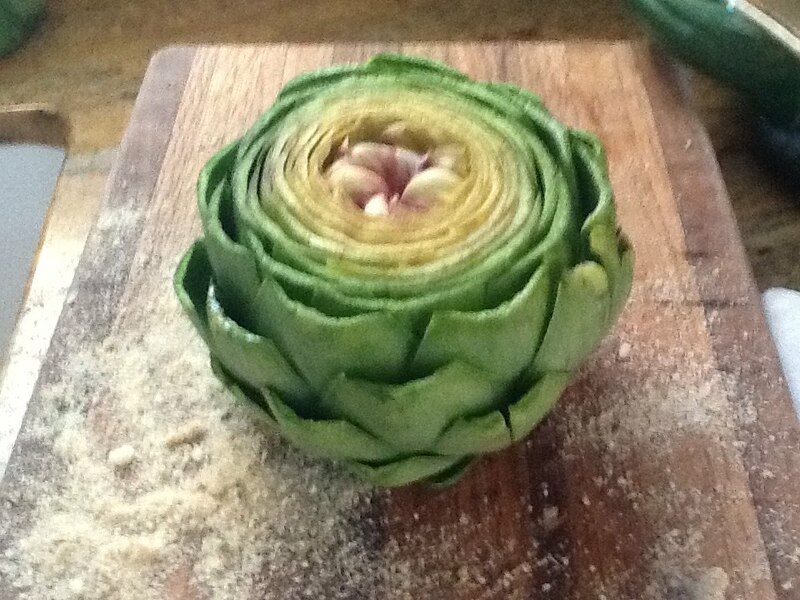 Using a serrated knife, cut off artichoke stems to create a flat bottom. Cut top thirds off artichokes, pull off tough outermost leaves, and trim tips of leaves with kitchen shears. Rub cut parts with lemon halves. Open artichoke leaves with your thumbs to make room for stuffing; set aside. I was surprised at how much the artichoke actually opened by using your thumbs to separate the leaves! 2. Heat oven to 425°. In a large bowl, combine bread crumbs, 3⁄4 cup pecorino, parsley, salt, pepper, and garlic. Working with one artichoke at a time over bowl, sprinkle one-quarter of bread crumb mixture over the artichoke and work it in between leaves. Transfer stuffed artichoke to a shallow baking dish. Drizzle each artichoke with 1 tbsp. oil. 3. Pour in boiling water to a depth of 1". Rub 1 tbsp. olive oil on a sheet of aluminum foil, cover artichokes with foil (oiled side down), and secure foil tightly around dish with kitchen twine. Bake until a knife easily slides into the base of an artichoke, about 45 minutes. Remove foil, sprinkle tops with remaining cheese, and switch oven to broil. Broil until tops of artichokes are golden brown, about 3 minutes. This recipe has a great tip - using a serrated knife to trim and shape the artichokes made it so much easier. Also this recipe doesn't require you to clean out the choke, which made it easier to manage. Once you got the heart, it was a simple effort to trim as you ate. I made this for a dinner we had last weekend, and they were a hit. I really loved the crispy breadcrumb/cheese combo, although the stuffing that was pushed further down into the leaves was not crispy enough for me. My dinner guests didn't seem to mind. I served them with a stuffed chicken breast, wild rice, and roasted green beans. Now this is how artichokes are meant to be eaten! I love that aunt Donna used to bring them to you guys on the East Coast - it's so much fun to associate food with great memories like that. Thanks for your great post, I can't wait to try this recipe! Yum!! I don't know why I'm afraid to do stuffed artichokes. Something about failing miserably at it. It intimidates me but it looks oh so good. Thanks for the great post, Nancy! Apparently we needed to coordinate our Artichoke posts, Nancy! Sorry for posting right on top of yours! 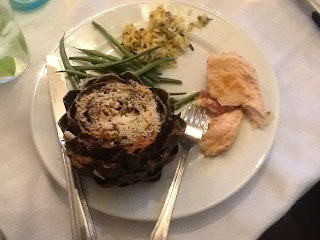 I almost tried a stuffed artichoke recipe, it looks so good. Definitley going to try this. Yum! I love that Aunt Donna would put them in her suit case, that's hilarious!